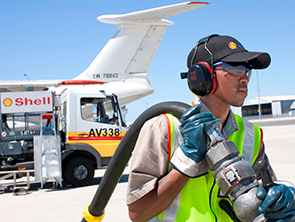 Shell Aviation provides fuel every day for about 7,000 aircraft at more than 800 airports in more than 35 countries. Customers range from private pilots to the largest global airlines and airports. Shell Aviation has been named Best Aviation Fuel Provider in the Emerging Markets Aviation Awards for the last three years, recognising the business’s safe and reliable supply of products and services to customers in emerging markets. Shell Commercial Fuels provides transport fuels, heavy fuel oils and heating fuels in bulk to 5,000 customers in 20 countries. Our customers include those in the transport, mining, manufacturing, power generation and home energy sectors. Shell Bitumen supplies on average 11,000 tonnes of products every day to 1,600 customers worldwide and invests in technology research and development to create innovative, award-winning new products. We are one of the largest premium grade bitumen suppliers in China and the only international bitumen supplier for the country’s high-speed railway sector. We have also developed innovative bitumen products that can be mixed and laid at temperatures lower than conventional asphalt to reduce energy use and CO2 emissions. Shell Sulphur Solutions has developed a dedicated sulphur business to manage the complete value chain of sulphur – from refining to marketing. The business provides sulphur for industries such as mining and textiles and develops new products which incorporate sulphur. Shell Gas (LPG) provides liquefied petroleum gas and related services to retail, commercial and industrial customers for cooking, heating, lighting and transport. Shell marine activities supply fuel and more than 100 grades of lubricants for marine vessels powered by diesel, steam turbine and gas turbine engines. We provide marine lubricants to more than 15,000 vessels worldwide, ranging from large ocean-going tankers, container ships and dry bulk carriers, to offshore drilling vessels and small fishing boats.